Last August my sister and I were picking some cherries for photo op up in Door County, Wisconsin. That’s when we were out of our minds and decided to do a Segway tour in Peninsula State Park and we both fell twice off them and I’m still having shoulder trouble a year later. I love cherries, and in August they were really cheap in the markets. I think I paid $1.99 lb. 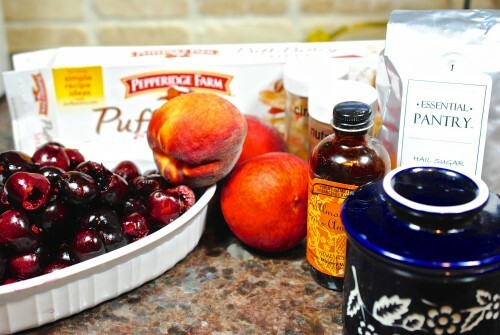 for these cherries and the peaches are some leftover from my Trader Joe’s box I bought. Before the peaches went bad and the cherries were all eaten (by me) I wanted to make something with them. While at Pike’s Market in Seattle I had a chance to taste some Rainier cherries. They are the golden looking ones that I always pass up in the grocery store for the red ones which I always thought were better. I was wrong, they are both delicious. My oldest son, Scott, loves Cherries and when we were visiting Chicago a while back I asked our 4 year old grandson if he liked cherries (knowing that his dad liked them). Oliver was so funny, he said “yes I like them but mom can’t buy them because dad eats them all up”; and he proceeded to say the same thing about potato chips. 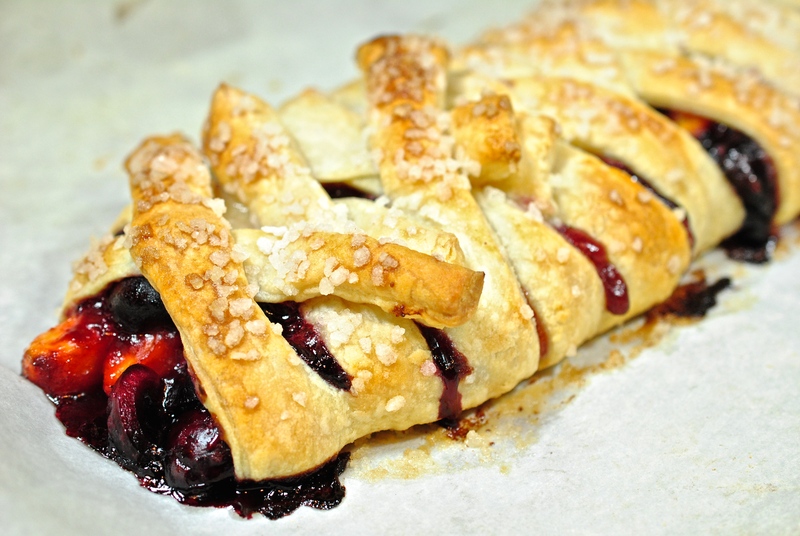 So before these fruits disappear from my refrigerator I decided to give this little breakfast strudel a try. 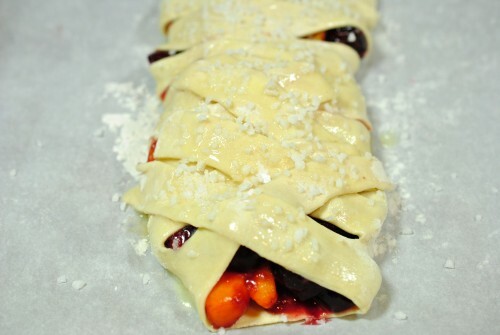 I saw a Cherry Strudel recipe at vegannook.com and decided to add some peaches and change up the recipe a bit. 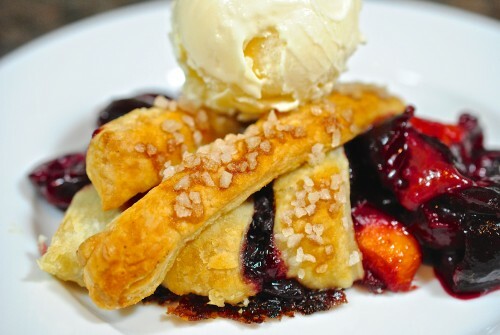 I turned the breakfast strudel into a dessert by adding a scoop of ice cream to the hot-out-of-the-oven pastry. 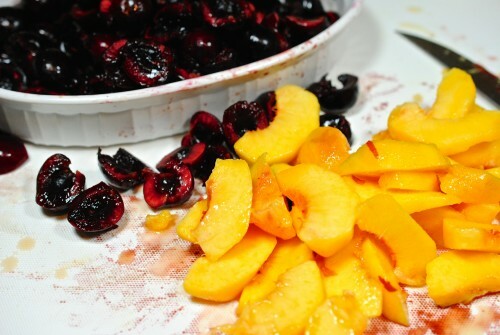 Peel, pit and slice the peaches and pit the cherries and cut in half. Cook the peaches and cherries in a little butter then add the flour, sugar and spices. 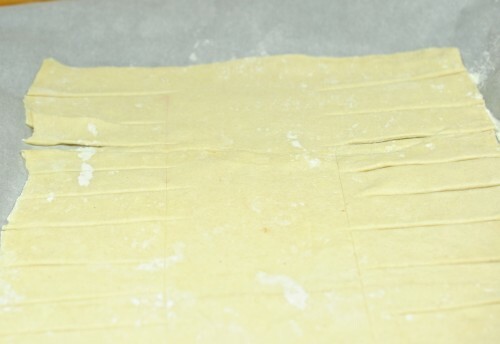 Roll out the puff pastry to 11 x 15″. Cut each side in about 3/4″ strips into the center panel. Put the fruit mixture in the center section of the pastry. Crisscross the side pieces over the center to cover fruit. Brush with melted butter and sprinkle with pearl sugar (or regular). Brown in 375° oven for about 30 minutes until nice and brown. Serve with ice cream or whipped cream or just by itself. Defrost the puffed pastry according to package directions. 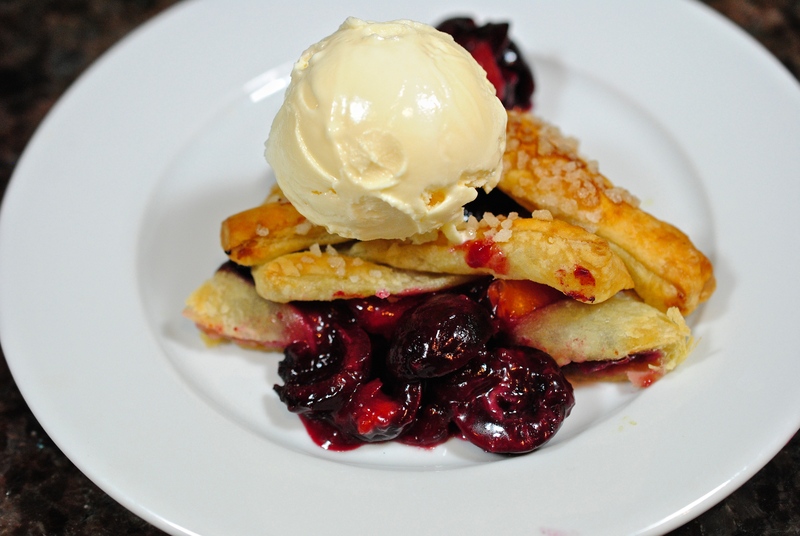 Pit the cherries and set aside. Peel and pit the peaches and slice. 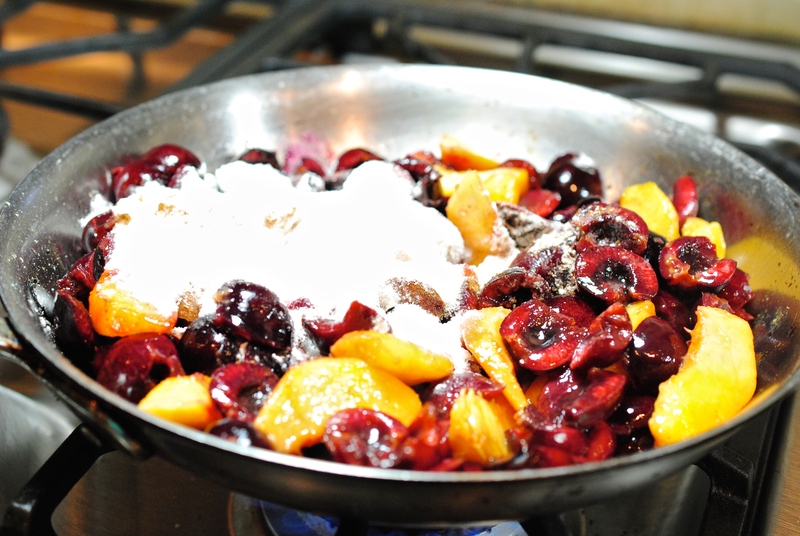 Melt the butter in a skillet and add the peaches and cherries and stir for about 5-6 minutes, just until they start to cook .Add the sugar, flour, cinnamon, nutmeg and salt to the fruit mixture. Remove from heat and add 1/2 tsp. almond extract. 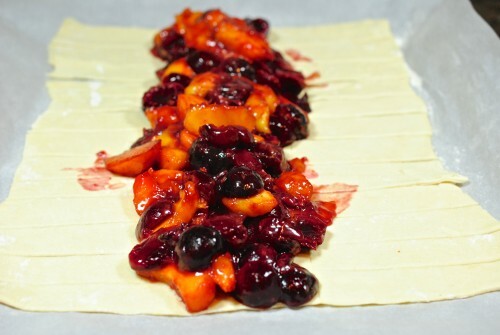 Unfold the puff pastry and roll out to about 11 x 15. with the short side in front of you, put the fruit mixture down the center 1/3 of the pastry. Using a paring knife cut strips 3/4″ wide down both sides of the pastry. Start with one side, then the other and pull the strips over the center, crossing over each other. Brush with melted butter and sprinkle with pearl sugar (or regular sugar). Bake at 375° for 30-35 minutes until puffed and golden. Allow to cool for 20-30 minutes before serving. 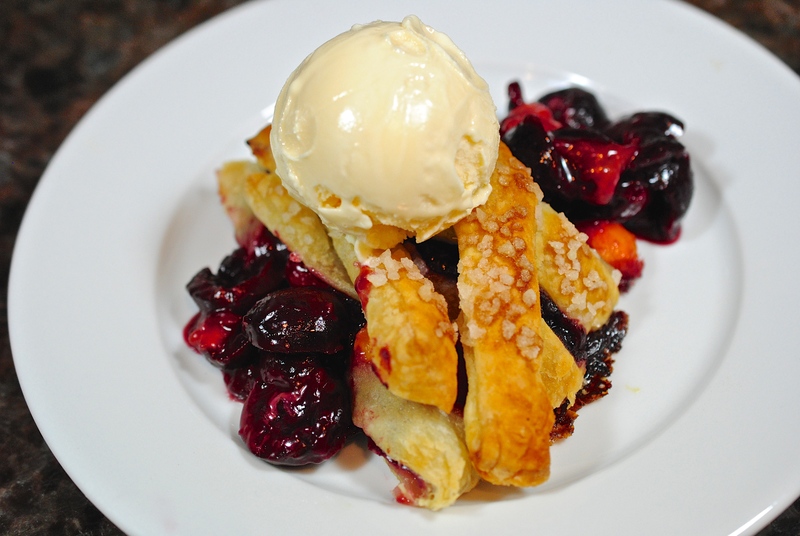 Serve with whipped cream or vanilla ice cream on the side.